Dragon’s mind thinks on how Rapture has gone away with the rest of Freak Force on a mission where they are no doubt saving the entire world. OverLord may know that Frank Darling is still alive and if SkullFace or anyone else from the Vicious Circle has caught up with him then he’s doomed. Dragon is still hunting for Octopus and has accompanied Julian Graham to an abandoned warehouse in search of the fugitive but has found only another dead end. The leeches that have bonded to two super-freaks remain a menace and fears that should anyone with real power get possessed then the city could be in real trouble. Dragon himself has become the latest victim and he punches Julian literally in half before destroying the building. He finds himself in a river but swims to shore before making his way into the heart of Chicago. She-Dragon approaches Captain Stewart about the possibility of joining the Chicago Police Department but does not get anywhere. She explains all about how her father was infected with something during the Vietnam War that was passed on to She-Dragon when she was born that eventually made her sick. Johnny Redbeard came to her aid by transforming her into a superhuman. Ray Wong interrupts the conversation by exclaiming that Dragon has gone on a rampage. Frank Darling narrowly avoids getting hit by SkullFace and flees for his life, knowing that he is no match for the villain. He climbs aboard a bus and rams his assailant into a brick wall but not event this has any kind of permanent affect. SkullFace bursts up through the bottom of the vehicle and continues his assault. Frank desperately breaks open a nearby fire hose and unleashes a torrent of water at SkullFace but this does not work either. At the Chicago Voice newspaper, R. Richard Richards demands that his photographers and reporters get footage of the Dragon on his rampage, feeling vindicated about all of the press he had given Dragon. Peter Klaptin had been visiting the paper and when he hears about the carnage unfolding, he excuses himself and runs off. She-Dragon desires to prove herself to the Chicago Police Department by tackling Dragon. She leaps into action but a single punch sends her flying backwards into a pile of debris. Darren McCarthy does his best to rally his fellow officers and they open fire upon the Dragon. The bullets all bounce off and Dragon proceeds to punch aside his colleagues. Howard Niseman relishes the opportunity to cut loose against Dragon but he gets beaten down just the same as the rest. Rita Medermade watches on helplessly but cannot bring herself to raise her gun up to fire at Dragon which leaves her open to a fatal blow. William Jonson is luckily on hand and he jumps into action to push Rita to safety. As the chaos continues, the Underground Freaks decide to join the fray but not even their might is enough to stop Dragon and are soon laid out unconscious. 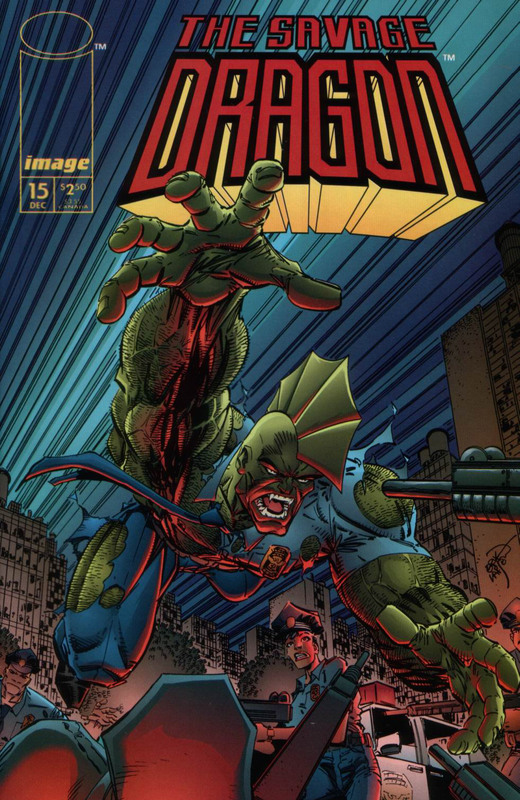 NOTE: The “Savage Dragon Vol. 4: Possessed” trade paperback collection inserts two new pages, featuring more of Frank’s fight with SkullFace and a possessed Dragon on the prowl.